CELEBRITY - From YahooEntertainment: Actor Todd LaTourrette, who has appeared on TV series like "Better Call Saul" and "Longmire," admitted that he cut off his own arm and is not a veteran who lost it in Afghanistan. MOVIES - From BleedingCool: Sigourney Weaver says that Neill Blomkamp's planned direct sequel to James Cameron's "Aliens" (1986) could still happen. BOX OFFICE - From BoxOfficeMojo: The winner of the 10/26 to 10/28/2018 weekend box office is "Halloween" with an estimated take of $32 million. MOVIES - From THR: Japanese director Shinichiro Ueda talks about his buzzy zombie film, "One Cut of the Dead." MOVIES - From Collider: Aaron Sorkin will direct "The Trial of the Chicago 7" starring Sacha Baron Cohen. MOVIES - From Deadline: Chris Rock will direct Universal's Kevin Hart comedy, "Co-Parenting," which Will Packer is producing. COMICS-FILM - From ThePlaylist: Spike Lee says that he is not directing Sony's "Spider-Man" spinoff film, "Nightwatch." STAR TREK - From Variety: The streaming service, CBS All Access, has ordered two seasons of the animated comedy, "Star Trek: Lower Deck." CELEBRITY - From YahooEntertaiment: 25 years after his death in 1993, actress Samantha Mathis is finally able to speak about the death of her boyfriend, actor River Phoenix. DISNEY - From Deadline: Disney is exploring rebooting "Pirates of the Caribbean" with "Deadpool" and "Zombieland" writers, Rhett Reese and Paul Wernick. PIXAR - From Variety: Ed Catmull, who cofounded Pixar with John Lasseter and the late Steve Jobs in 1986, is retiring from his leadership role at Pixar and at Walt Disney Animation. He will transition into an advisory role in 2019. STREAMING - From Collider: Steve Carell is returning to television in an untitled drama from stars and executive producers Jennifer Aniston and Reese Witherspoon for Apple TV. ANIMATION - From BleedingCool: Oscar-winner Guillermo del Toro is co-writing and co-directing a stop-motion animated version of "Pinocchio." The project's home is Netflix. SPORTS-MOVIES - From BleedingCool: LeBron James and his Springhill Entertainment production company may reboot Paramount's "Friday the 13th" franchise. SPORTS-CRIME - From NFL: Former NFL wide reciever, Rae Carruth (Carolina Panthers) was released from prison, the Sampson Correctional Institution in Clinton, North Carolina, Monday morning, October 22, 2018. Carruth served 18 years of a 24-year sentence for conspiracy to murder his then-pregnant girlfriend, Cherica Adams, in November 1999. After being shot four time, Adams fell into a coma and died nearly a month later. The child, Chancellor Lee Adams, she was carrying was delivered via cesarean section and will be 19 years old this year. From SportsIllustrated: The boy they couldn't kill, Chancellor Lee Adams. BOX OFFICE - From BoxOfficeMojo: The winner of the 10/19 to 10/21/2018 weekend box office is "Halloween" with an estimated take of $77.5 million. From TheWrap: With an estimated opening of $77.5 million, "Halloween" has the biggest opening weekend for a film with a lead actress who is older than 55 years old. AWARDS - From GoldDerby: The site talks up Regina King's Oscar chances for Barry Jenkins' "If Beale Street Could Take." CELEBRITY - From People: Actress Selma Blair reveals that she has MS - multiple sclerosis. TELEVISION - From BloodyDisgusting: First footage revealed of Robert Englund as "Freddy Krueger" on the Halloween episode of "The Goldbergs." MOVIES - From THR: Steve McQueen ("12 Years a Slave") is back and he never thought of himself as anything other than brilliant. From ESPN: Former Major League Baseball player, Willie McCovey, has died at the age of 80, Wednesday, October 31, 2018. McCovery played 19 of his 22 MLB seasons for the San Francisco Giants. He was the 1959 National League "Rookie of the Year" and the 1969 National League MVP. He was inducted into the Baseball Hall of Fame in 1986. He played in one World Series, as the Giants lost the 1962 series to the New York Yankees. From People: American actress Diana Sowle died at the age of 88, Friday, October 19, 2018. Sowle was best known for playing the role of "Mrs. Bucket," the mother of golden ticket winner, Charlie Buckett, in the film, "Willy Wonka and the Chocolate Factory. San Francisco, CA — VIZ Media, LLC (VIZ Media), a premier company in the fields of publishing, animation distribution, and global entertainment licensing, announced a pair of new publishing acquisitions this past weekend at New York Comic Con 2018, including of THE ART OF NEON GENESIS EVANGELION: 2007-2017 and the shojo manga series DAYTIME SHOOTING STAR. San Francisco, CA — VIZ Media, LLC (VIZ Media), a premier company in the fields of publishing, animation distribution, and global entertainment licensing, delights anime fans as it announces the home media release of SAILOR MOON S: THE MOVIE. The second feature film of the popular fantasy/adventure anime series is now available as a Blu-ray/DVD Combo Pack as well as a Standard Edition DVD Set. BURBANK, Calif.--(BUSINESS WIRE)--Principal photography is underway on the third installment of New Line Cinema’s hugely successful “Annabelle” films, starring the infamous sinister doll from the “Conjuring” universe. Screenwriter Gary Dauberman (“The Nun,” “IT” films, “Annabelle” films) helms his first feature in the $1.5 billion “Conjuring” franchise. The new horror film is once again being produced by “Conjuring” universe creator James Wan through his Atomic Monster production company, and by Peter Safran, who has produced all the films, through The Safran Company. From New Line Cinema, the film is set to open in theatres July 3, 2019 and will be distributed by Warner Bros. Pictures. San Francisco, CA – VIZ Media, LLC (VIZ Media), a premier company in the fields of publishing, animation distribution, and global entertainment licensing, announces the release of Season 2 of the sci-fi horror series TERRAFORMARS: REVENGE on October 23rd, 2018. San Francisco, CA – VIZ Media, LLC (VIZ Media), a premier company in the fields of publishing, animation distribution, and global entertainment licensing, announces the home media release of the ACCEL WORLD: INFINITE BURST movie on October 23rd, 2018. Ant-Man and the Wasp is a 2018 superhero film and sci-fi action-comedy directed by Peyton Reed and produced by Marvel Studios. It is a direct sequel to the 2015 film, Ant-Man. Both movies focus on the Marvel Comics character, Ant-Man, who first appeared in Tales to Astonish #27 (cover date: September 1962) and was created by Stan Lee, Larry Lieber, and Jack Kirby. Ant-Man and the Wasp finds the title hero on a new adventure to uncover the secrets of his friends' past. In the wake of the events depicted in Captain America: Civil War (2016), Scott Lang/Ant-Man (Paul Rudd) is under house arrest. He is three days from finishing his sentence, so he is determined not to leave his house and be in violation. 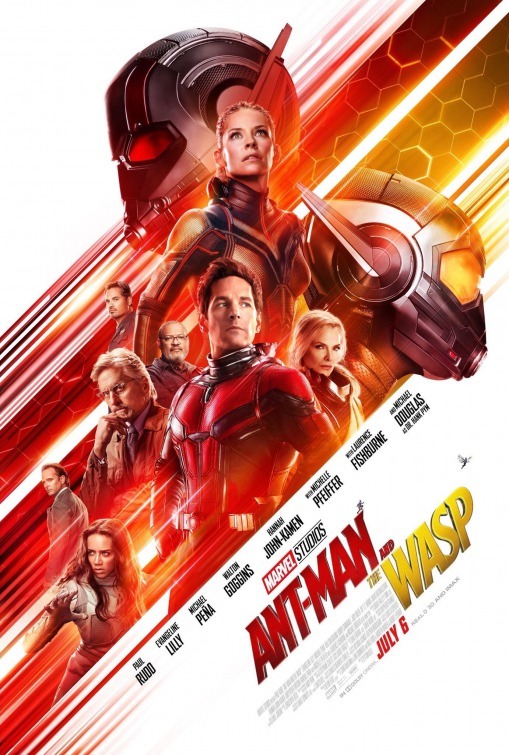 However, Hope van Dyne/The Wasp (Evangeline Lilly), Scott's erstwhile girlfriend, and her scientist father, Hank Pym (Michael Douglas), who have both been estranged from Scott, reenter his life. They need Scott's help in rescuing the original Wasp, Janet van Dyne (Michelle Pfeiffer), who has been lost in the microscopic “quantum realm” for 30 years. However, there are numerous obstacles in their way. FBI agent, Jimmy Woo (Randall Park), Lang's parole officer, is determined to catch Scott in violation. Sonny Burch (Walton Goggins), a low-level, but ambitious thug, is determined to obtain Hank Pym's technology so that he can sell it on the black market. Bill Foster (Laurence Fishburne), a former colleague of Hank Pym, claims that he will help Pym in his quest, but Foster is really out to help Ava Starr (Hanna John-Kamen). This mysterious young woman is also the costumed “Ghost,” who needs the same technology that Scott, Hope, and Hank need. She will do anything to get it because time is running out for both her and Janet Van Dyne. Ant-Man is D-list as far as Marvel Comics superheroes go, especially where familiarity with the general entertainment-consuming public is concerned. Marvel Studios chose the right actor to play Ant-Man, Paul Rudd, who is irresistibly likable. In the original film, Ant-Man, Rudd's affable charm sells the idea of Scott Lang as a well-meaning criminal who had a just cause for the crime he committed. Ant-Man might be a silly concept, but Rudd makes it all seem less so. After stealing some scenes in Captain America: Civil War, Rudd and Ant-Man are pretty much settled in near the upper echelon of the Marvel Cinematic Universe. For the new film, Ant-Man and the Wasp, the visual effects (VFX) are the biggest star. The process of shrinking and growing characters and all manner of objects (building, automobiles, knick-knacks, etc.) have a rhythmic quality. The VFX flows and is poetic; call it “floetry” (like the early aughts R&B group). While watching this new movie, I never thought it was too much. Sure, I like the new character, Ghost, and the child actress, Abby Ryder Fortson, makes Scott Lang's daughter, Cassie, indispensable as a character. [How about Cassie as a new Marvel superhero?] Still, from the first time I heard of an Ant-Man movie, I thought that this character and concept was born to take advantage of computer-generated imagery (CGI) and of the advancement in VFX. Ant-Man and the Wasp is a cinematic magic spell successfully completed. It is not a great movie, but it greatly and hugely entertained me. The text is copyright © 2018 Leroy Douresseaux. All Rights Reserved. Contact this blog or site for reprint syndication rights and fees. Angela Bassett to Narrate Nat Geo Special, "The Flood"
WASHINGTON--(BUSINESS WIRE)--National Geographic announced that Golden Globe-winning and Academy Award-nominated actress Angela Bassett will narrate its stunning two-hour wildlife documentary special The Flood, which premieres Sunday, Nov. 25, 2018 at 8/7c on National Geographic. Set in the heart of Africa’s Okavango Delta wilderness, The Flood tells an enchanting story of life around a wild paradise like no other on earth. Surrounded by the unforgiving Kalahari Desert, the Okavango Delta is a lush, vibrant oasis that pulses with life each year as the great flood rejuvenates the land with the return of water. Witness how incredible animals – like leopards, elephants, lions, hippos and more – adapt to this unpredictable and changing landscape. When the lands are flooded, the Okavango Delta is both a sanctuary and a trap, giving and taking life in equal measure. Then, like a living, breathing ecosystem, the waters soon recede and life becomes about one thing – survival. The fate of the tens of thousands of animals that live in this place of spectacular natural drama is at stake. The Flood will premiere globally on National Geographic and/or Nat Geo WILD in 172 countries and 43 languages. For more information, visit www.natgeotvpressroom.com, or follow us on Twitter using @NGC_PR. The Flood is produced by Icon Films in association with Natural History Film Unit Botswana for National Geographic. Icon Films executive producers are Harry Marshall and Laura Marshall. Natural History Film Unit Botswana producer is Brad Bestelink. For National Geographic, executive producer and senior vice president of development and production is Janet Han Vissering and executive vice president and general manager is Geoff Daniels. Angela Bassett is a Golden Globe winning and Academy Award nominated actress, as well as a Directors Guild of America nominated director. Angela recently starred in Ryan Coogler’s highly acclaimed BLACK PANTHER with Chadwick Boseman, Sterling K. Brown, and Lupita Nyong’o; and in MISSION: IMPOSSIBLE-FALLOUT with Tom Cruise. She also executive produces and stars in 9-1-1, Ryan Murphy’s newest hit series for Fox; and showcased her directing talents in AMERICAN HORROR STORY: CULT. Last season, Angela received an Emmy nomination for Outstanding Guest Actress in a Comedy Series for her performance in Netflix’s hit series MASTER OF NONE opposite Lena Waithe. She also joined the directing team of FX’s AMERICAN HORROR STORY: ROANOKE while simultaneously appearing as a member of the all-star cast. Previously, she appeared as Ramona Royale in AMERICAN HORROR STORY: HOTEL alongside Lady Gaga, Sarah Paulson, and Matt Bomer. She received Emmy nominations for Outstanding Supporting Actress in a Miniseries for her work as Marie Laveau in AMERICAN HORROR STORY: COVEN, as well as for her work as Desiree Dupree in the carnival themed AMERICAN HORROR STORY: FREAK SHOW. Angela will next star in BUMBLEBEE alongside Hailee Steinfield and Justin Theroux as the Decepticon, Shatter, in theaters this December.